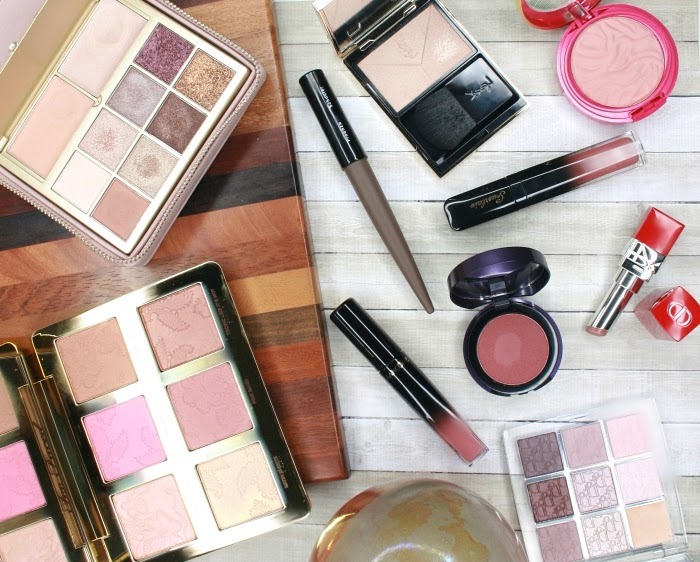 You know Lancôme is one of my favorite brands, so whenever they launch something new I'm always excited to try it. Even when it's a product that I wouldn't usually consider buying, like liquid highlighting drops! That's why I purchased their new Custom Strobing Drop (yes, it's called "Drop", not "drops"), not knowing if it would work for me at all. 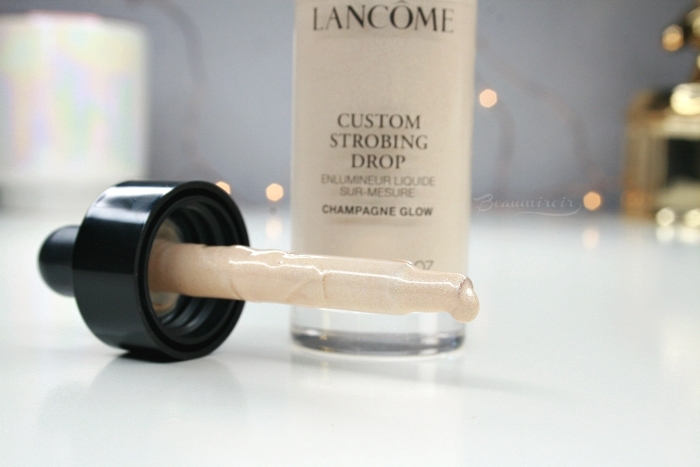 Did Lancome convince me that highlighting drops are useful or was it a miss for me? Keep reading to find out! Lancôme released these new drops in four shades that come in the same packaging, but have a different official name depending on the color. The ones I bought are called Custom Strobing Drop and the shade is Champagne Glow, the lightest of the four. The shades Rose Glow and Golden Glow are called Custom Highlight Drop, and the deeper color Bronze Glow is a Custom Sculpting Drop. Talk about making things confusing! Anyways, my Custom Strobing Drop comes in a simple and elegant glass bottle with a black cap and a dropper. The dropper system, if you ask me, does not work very well with this product. The texture is creamy and on the thicker side, it's not really a liquid, so it's hard to get product sucked into the glass pipette. The opening of the bottle gets messy very quickly too. I think a pump would have been a better idea. The 15ml it contains (0.5 fl oz) will likely last me more than a lifetime, since a little goes a very long way. Remind me to include them in my will. Champagne Glow is a very pale golden beige that is packed with very fine shimmer. It creates a soft wet looking glow on the skin but you can also see some of the sparkles, although they're tiny. Some liquid highlights create a sheen without visible glitter, but it's not the result I get with this product. It looks shimmery rather than just glowy, if that makes any sense. According to the brand these drops can be mixed into foundation to add an allover glow, or used on targeted areas as a classic highlight. 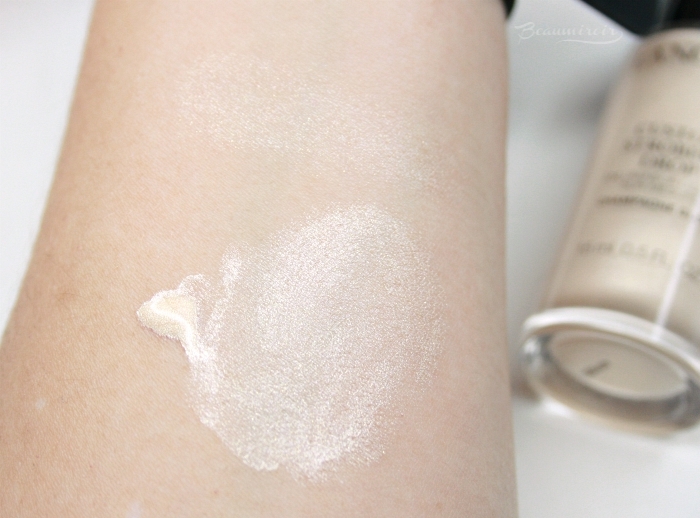 I do love a good liquid highlighter, however I'm not usually one to mix my makeup products - I'm just too lazy for that - but it turns out that this is how these Strobing Drops worked best. 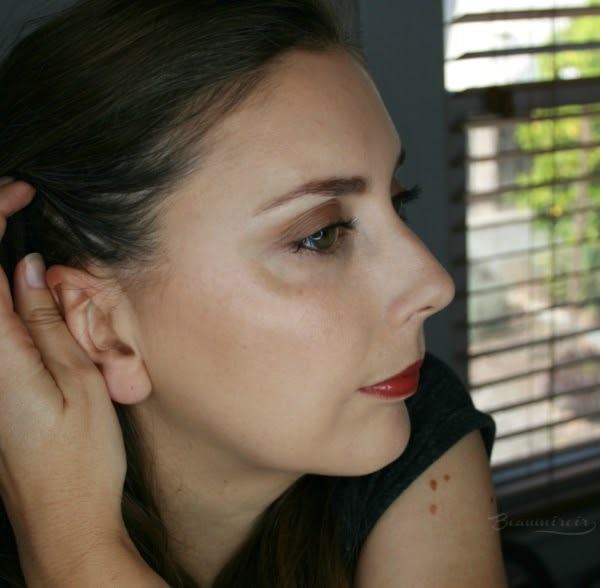 I thought I would prefer to use the Custom Strobing Drop as a simple liquid highlighter. I love Lancôme's Cushion Highlighter and I was kind of hoping that these drops would be the same thing in a bottle. But they didn't work as I expected. 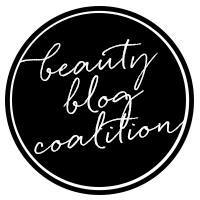 Applied with a brush or sponge they don't blend into the skin as seamlessly as I was hoping. They sink into my pores, stick to the peach fuzz, and look rather patchy. And they disturb the foundation I'm wearing underneath pretty badly. If I apply them with fingertips in a tapping motion I can get them to blend better, but then my foundation is completely lifted off my face in the area. 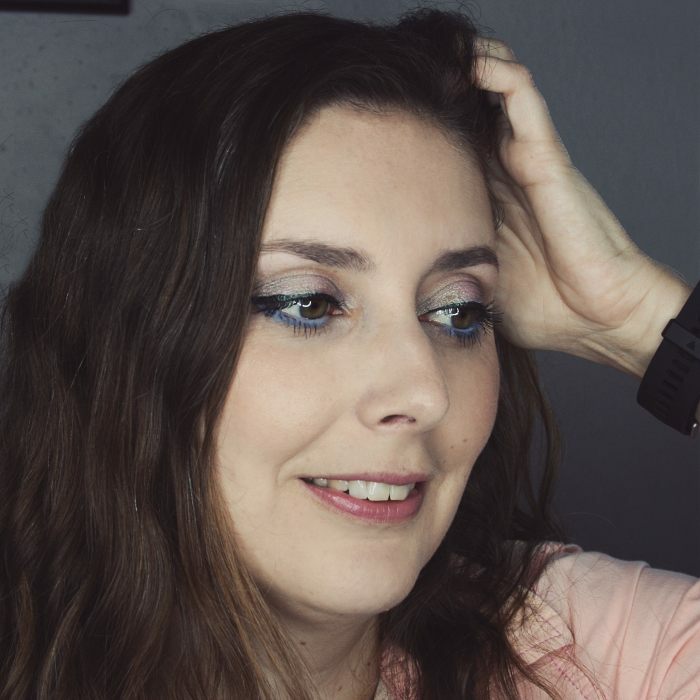 If you take a look at the photo below where I'm wearing them, you'll notice a dark spot just at the limit between my undereye and my cheekbone. You don't usually see this sun spot in photos because it's covered by my foundation. But here my foundation was completely gone in this area after applying the drops. Seeing that the Custom Strobing Drop was rather disappointing as a liquid highlighter, I decided to give it a try as a "mixer". Like I said I don't usually bother mixing anything with my foundations. 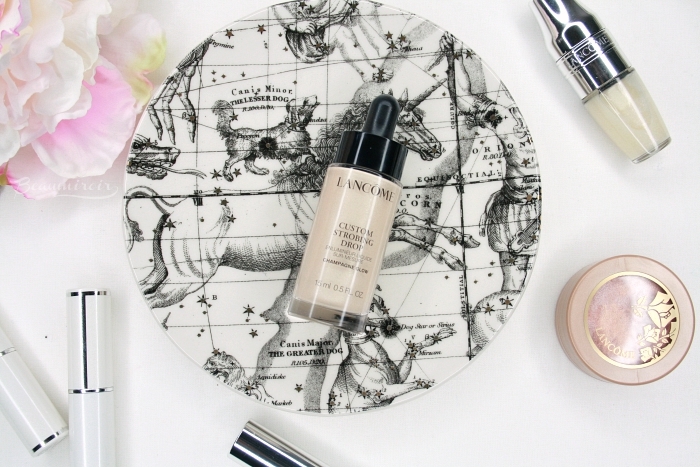 I much prefer to find a foundation that works for me as is and just slap it on my face! 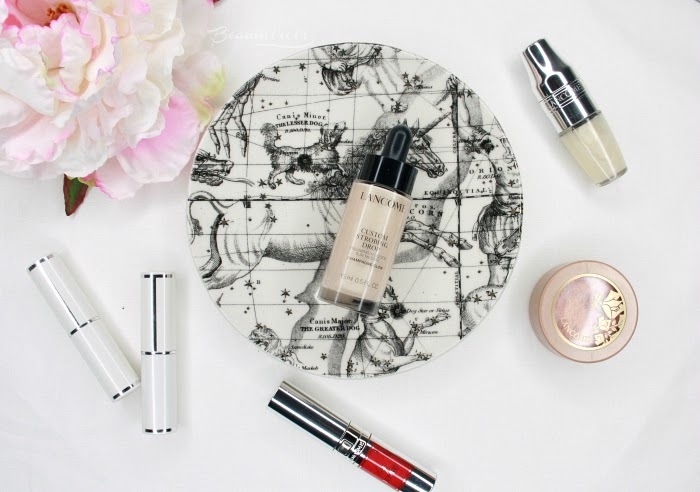 But I felt like I should give this product a chance, so I added a drop of it to three pumps of my least favorite foundation, the Smashbox Studio Skin. I find that one dry, cakey looking and too matte on my skin, which is why I typically only use it when I take pictures (it does look flawless on camera). And to my surprise, the Strobing Drops dramatically improved the foundation. It looked much better on my skin, a lot smoother, more natural and more luminous. You couldn't see sparkles on my face, but the foundation looked more fresh and radiant. It even applied a little more easily! 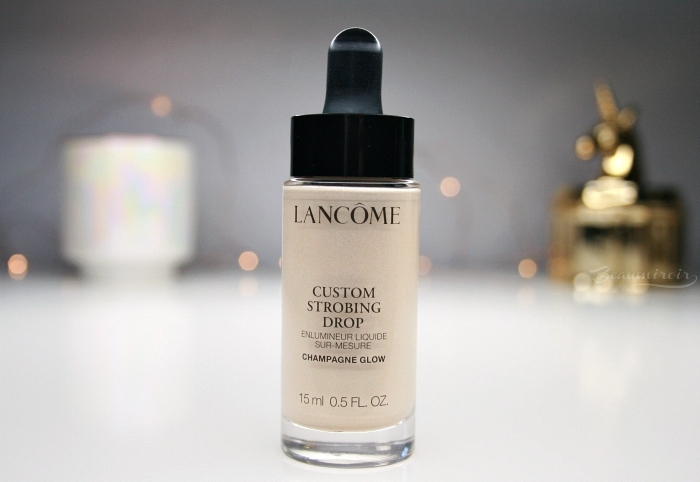 While I wasn't convinced by the Custom Strobing Drop as a liquid highlighter, the way it enhanced a mediocre matte foundation when mixed to it really surprised me. If you're someone who likes to do their own custom mix to achieve the perfect base product, you might want to give these drops a try!